Dennis Fujimoto has been in the news gathering business from an early age. He started collecting informative tidbits in elementary school where English replaced pidgin. In the 5th grade, he covered Pop Warner games for the newspaper. In high school, he honed his photographic skills and selected journalism because it complimented his interest in photography. His first job out of college was with the TV Guide, which allowed him to travel extensively. He’s been the primary photographer at The Garden Island for over 20 years. 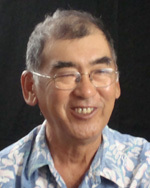 Dennis Fujimoto began his professional journalism career shooting photos for TV Guide. To conquer his timidity, a veteran reporter taught him to remember he was just as good as his subjects when he shot their pictures. Then he turned that around, and he learned to treat everyone he shot as if they were a “cover person” – an attitude that acknowledges the abiding impact of putting a picture in the paper.